Goldilocks wants to try pasta with ragu. I tried to explain her that ragu sauce requires time and it’s usually done in winter, not on hot summers, but she instisted. I decided to use the rest of the sausages I bought earlier to make a “quick” one hour ragù with some spices to give it a cacciatora-like taste. The result was better than i thought. 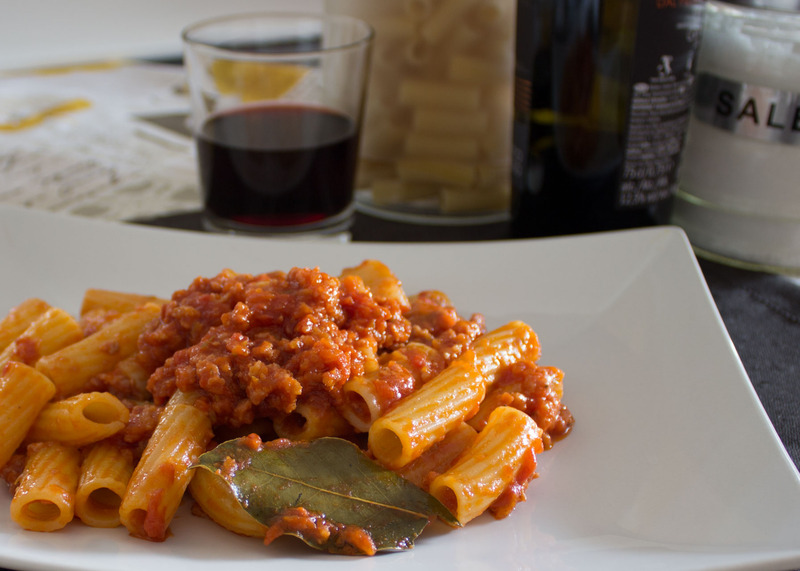 Note: This is not the traditional recipe for Ragu alla bolognese. An amazing meal for two! Cut the tomatoes in slices and place them in a bowl. I usually remove all the seeds and the hardest parts (like stems) first, which I then squeeze through a sieve to get the most juice out of them. Add a pinch of died tyme to the sauce. Finely mince the half onion, the carrot and the celery leg and put them in another bowl. Remove the peel from the sausage and cut the filling to form a sort of grinded meat. Warm up the olive oil in a large frying pan with the smashed clove of garlic. When hot enough, add the half onion, the carrot and the celery, the rosemary, the savy and the baytree. (1). Let the vegetables sautè for around 10 minutes at low temperature, without letting them burn, then remove the clove of garlic and add the sausage (2). Roast everything for another 10 minutes at medium-heat. The sausage filling should release enough fat to avoid the vegetables to burn and start to brown. Be careful to break the bigger pices of meat, if there’s any. Then rise the heat to high and simmer with white wine until reduced (3). Finally, add the tomatoes with their sauce (4). I strongly suggest not to drain the fat: it will create a creamy reddish sauce that will stick to the pasta. Once the tomato sauce is boiling, lower the heat to minimum and let it simmer for at least 40 minutes. The more it simmers, the better it is. Around half of the cook, adjust of salt and eventually correct the acidity of the tomatoes with some sugar. When it’s ready, rise the heat to let the remaining water to evaporate, if any, then add the pasta of your choice, with a little of its water. Mantecate two minutes at high heat, until the sauce is dense but not dry, and then another minute off heat. Then plate and serve ASAP, with a grind of pepper on top. I wouldn’t personally add any cheese to the pasta, not to cover the erbs taste. 3. Once ready simmer with wine until reduced.